Not only do Cotacachi, Papallacta, Atahualpa offer exquisite views, local culture, and outdoor activities – both up close and at a distance – but there are also a series of micro climates that enable different types of farming at different altitudes. The micro climates enable production of everything from roses to cheese, potatoes, and unusual but delicious fruits. Cotacachi, Papallacta, Atahualpa offer hot springs from the volcanoes, organic farming, high quality leather goods, and crafts, in addition to the scenery, hiking and other outdoor sports. valley countryside, colonial charm, indigenous culture, and great weather – between 70-80 degrees F year round during the day and 50-60 degrees F at night. The fresh organic fruits and vegetables are a draw for expats, and the local people are very friendly. Cotacachi is known as the ‘Leather Capital of Ecuador.’ I have heard that the Italians come to Cotacachi to buy their leather goods. It is considered an artisan city. Head to Calle 10 de Agusto, known as Leather Street, where you can shop for leather jackets, shoes, boots, handbags, wallets, and everything made of leather. Plan to go for a Sunday Market day when more local artisans have outdoor stalls. We met and became friends with a couple from Virginia who moved to Cotacachi – Bill and Carolyn. We even found pizza in Cotacacchi – the expat influence. Take a detour to the Laguna de Cuicocha and Volcan Cotacachi, about a 15-minute drive from Cotacachi. You can hike around the crater lake, called ‘Lago del Cuy’ in Kichwa, the local language, which means Guinea Pig Lagoon. The lake has forested islands in the middle, and a trail around the perimeter for hiking. 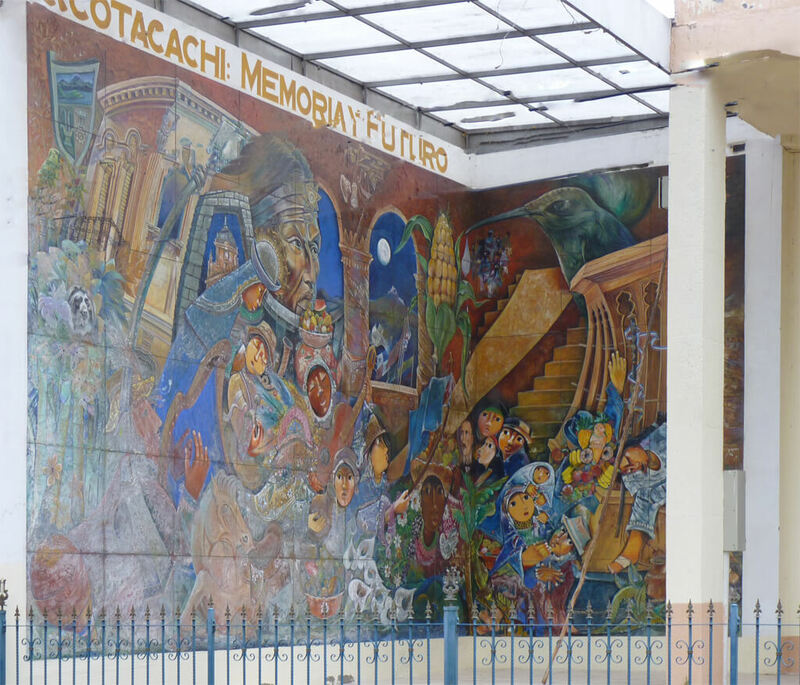 In South America, you will find a town square in every town, including Cotacachi, Papallacta, Atahualpa. They are lovely, with trees and flowers, sculptures, and benches. Usually there is a Church on the square. It’s a great meeting place and a terrific spot for people watching. 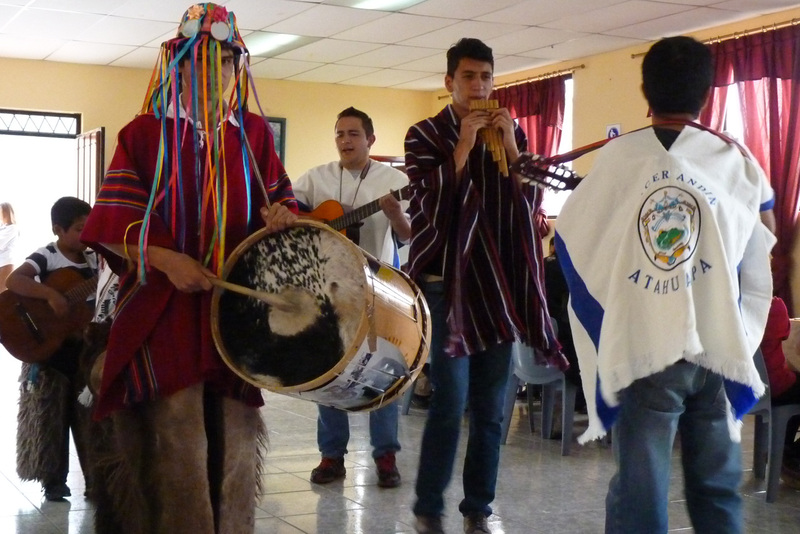 Cotacachi, Papallacta, Atahualpa are worth the trip. These parts are not generally included in your typical tours and we found them gorgeous, interesting, and well worth the time. Papallacta is a small village in the Napo Province of Ecuador. It is at 10,800 feet in the Andes on the road from Quito which leads into the Amazon jungle. The drive is scenic from Quito to Papallacta if you do it in the daylight, which we did on our return trip only. The road takes you through towns and small villages and then over a peak of more than 13,000 feet. At this point you can see mountains and glaciers. As you head down from the peak to Papallacta, the environment goes from from alpine to tropical jungle. If you are driving it, know that there are no lights as you climb higher into the mountains. Papallacta is at almost 11,000 feet in the Andes. The roads were under construction when we were there in January of 2016, and we couldn’t tell if we were on the road or headed off a cliff. If you drive yourself in the dark, know that it can be very hard to navigate the road. A local family who we spent a few days with picked us up by car and took us to Papallacta, where the volcanoes create hot springs. After going to Banos, I was a bit wary about the cleanliness. I have to say Papallacta was gorgeous, clean, with great scenery. We went to Termas de Papallacta, a resort that the public can pay to use for a fee. It is well worth the $22 per adult for access to the gorgeous pools. They also offer spa services. Several hot springs and spas are located in Papallacta. Many of the local restaurants are known for their steamed trout. For lodging, there are several hotels and a resort. 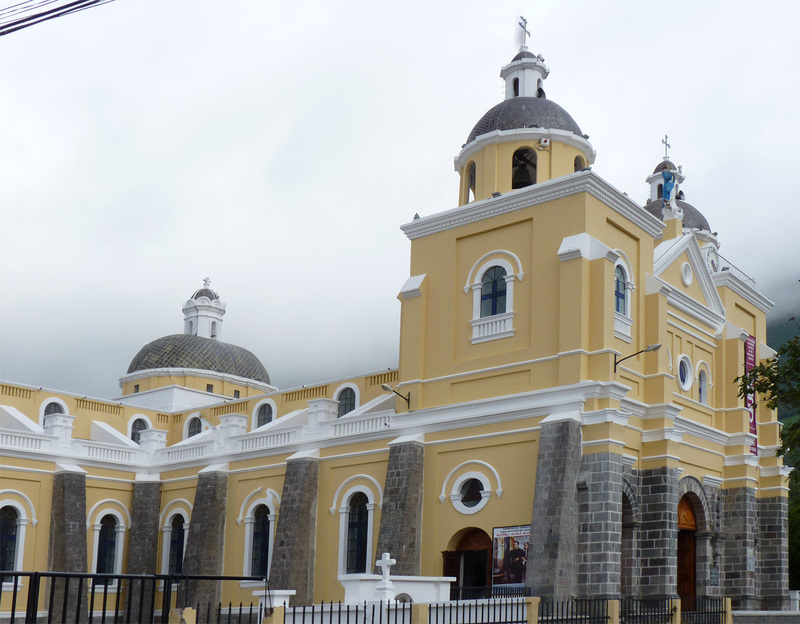 Papallacta is a short trip from Quito and you can go by bus, or drive if you have a car. We were picked up at 4 AM so we would arrive by 6 AM when the pools open. While it seemed a bit early, we were happy to be the first ones in the pools, and arrive before the bus loads of people came at 10 AM. We took our breakfast and ate after our dip in the pools. We left Termas de Papallacta at 10 AM as the buses were unloading and headed back towards Quito, aiming to stop in a small town for a special lunch experience. We went to a place called ‘Pesca San Isidro,’ east of Quito, to catch our trout for lunch and enjoy the outdoors. It was hard to find, and the family knew the owners, so we were well taken care of. They also have horses for riding and other animals and amusements – a great place for kids too. ador’s capital city of Quito. Known for its 3 climates, Atahualpa is subtropical, temperate and cold, which enables the growing of various fruits and vegetables, as well as cultivation of other products like dairy products and roses. We visited a family hacienda to take in the views, and way of life. This elder Ecuadorian couple had spent their working years in New York City, and retired to their homeland, Ecuador, for a quiet peaceful life in touch with the land and nature. They are happy to host people, especially given the opportunity to practice their English and socialize, since their company is their farm animals. If you want stay with them, we can arrange it. There are also times that they look for house sitters for their estate. Micro cheese and yogurt production businesses are a focus for some families who live in the highlands. They awaken to milk the cows and throughout the day process the milk into cheese and yogurt. Both are delicious. We had a full demo of cheese production. Their products are sold in the big grocery stores in the cities. 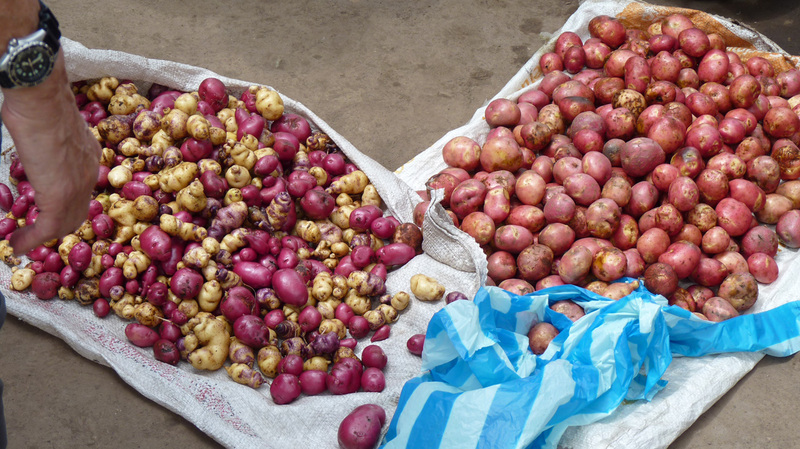 Family members also farm, and we bought sacks of potatoes for $1 and 6 avocados for $1. Other fruits and vegetables are farmed throughout the area. They make wines and liquors from some of the fruits. While in the town square, we visited a local home where they raise exotic chickens and orchids. An interesting place – and very different from anything we might imagine in the US. The family all helps in raising the flowers and animals, and are very proud. In town, we were entertained as if we were celebrating a local fiesta, with local foods and local entertainment – music and costumes worn by the local men. It felt very tribal. They played their music as they walked in a circle in the middle of the room. They got us up to follow them, making a large circle, and joining in on the festivities. Apparently Topiary Garden Cemeteries are not uncommon in Ecuador. We had a lively jaunt around one of them. It is different! As we descended the higher altitudes, a very special stop was at a rose grower. We were there in January before Valentine’s Day and learned that Ecuador is the largest provider of roses to the US on Valentine’s Day, and also the largest provider of roses to Russia. Some purchased 18 very long stem roses for $1.50. As we left they gave each of us a rose as a souvenir. I ended up with 3 roses, and they were still alive 2 weeks later when we left Ecuador. Atahualpa, Cotacachi, and Papallacta provide a different view of Ecuador, and a view fewer tourists experience. Have a look for yourself, and be sure to view the hundreds of orchid species all over Ecuador. And don’t forget, if you want to stay in the family hacienda, let me know and we will arrange it. We used many resources to find rooms. AirBnb, Ttripadvisor, and more. This entry was posted in Andes Mountains, Ecuador, South America and tagged Cultural Adventure, Culture, Ecuador, Hiking, Hot Springs, International Travel, Land Adventures, Nature, Outdoor Adventures, Travel by Wendy. Bookmark the permalink. 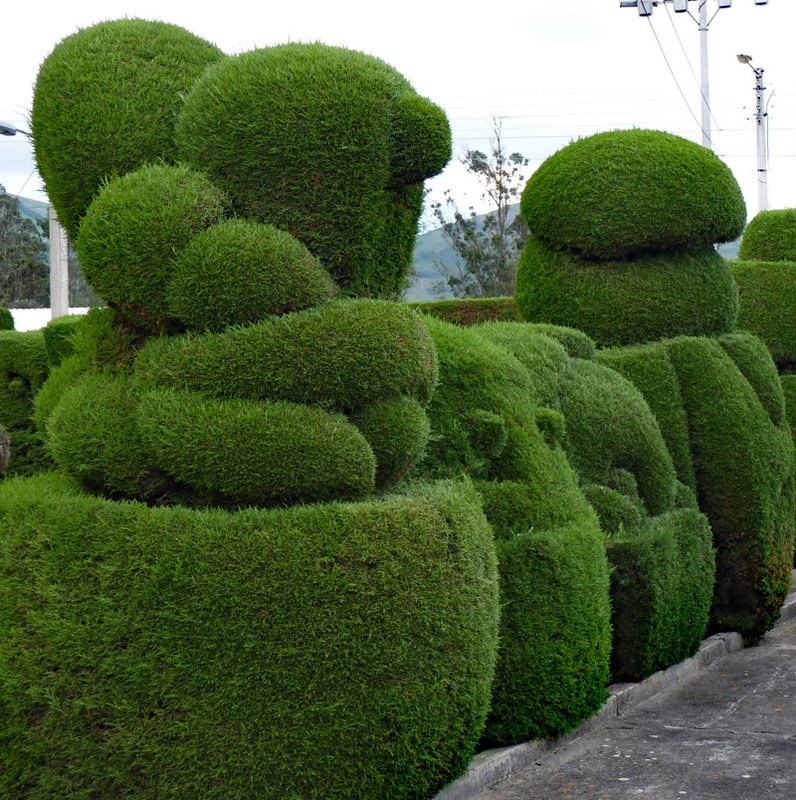 When I get to Ecuador, I definitely want to visit one of the Topiary Garden Cemeteries! I saw a lot of topiary in general in rural Chile as well. Ecuador is so diverse. Your pictures look stunning! We’ve been two months but most of the time volunteering in one place. Wow, absolutely gorgeous! I can see that we should have spent more time in Ecuador on our visit. Guess we’ll have to go back. Wow, what an informative and interesting post. I love getting to places that are a little off the beaten track. Good tip about not driving the road at night. I look forward to reading more of your posts when you link up with us again. Thanks Jan. I plan to link up with you again and have asked Nancie how to join the group. If you would please subscribe to the blog so you know if the subject matter that may interest is something that I put out, even if it is a week where I do not link up. Happy travels!